Our 150mm (6") 90 degree T piece with cap flue bend is manufactured for use in solid fuel stoves. 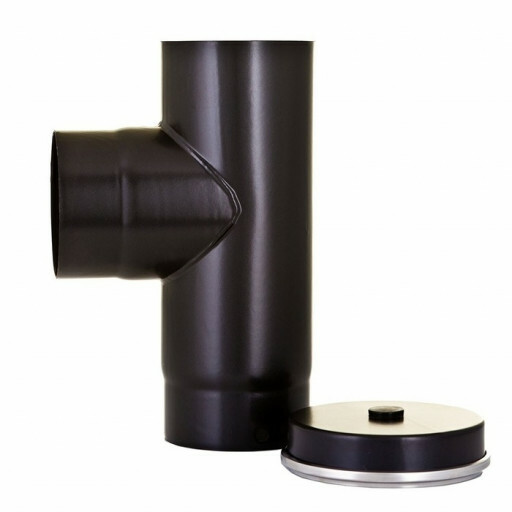 This tee piece component is designed to connect directly to the rear outlet of a stove, creating a vertical flue pipe system and offer an access point for cleanout by removing the included tee cap. Our 150mm (6") 90 degree T piece with cap flue bend is made of high-quality heavy gauge steel, fully welded to seal all joints keeping you safe from flue gas leaks. The height of this tee piece is 300 mm and is made to take a 150 mm (6 inch) flue pipe at the top by inserting the male end. Any deposits that form within the flue will fall into the lower part of the tee section for easy cleaning by removing the cap. Meant for use within the home, this exposed pipe has a durable, heat-resistant black enamel applied to both inside and outside of the pipe. The paint finish is ensured to last for years and will look impressive in any space. This pipe is single-wall and for internal use only. The pipe component is not meant to pass through any materials. The black finish will refresh your home's decor and is made to match the coating found on most stoves popular in the UK.